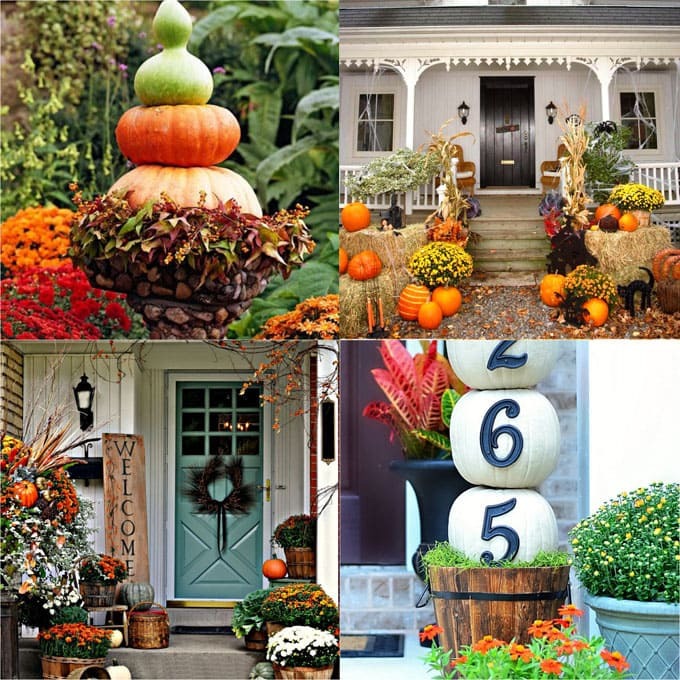 The glorious fall season is here, and we need a beautiful DIY fall wreath on the front door! 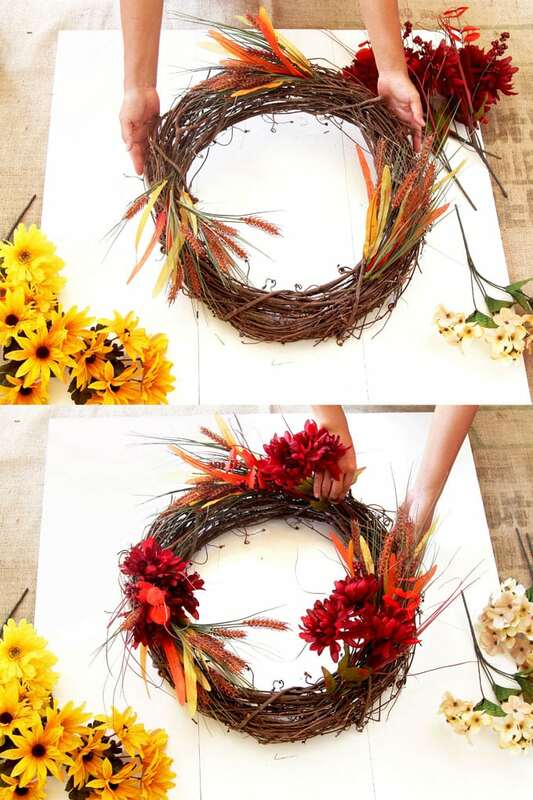 Bursting with fall colors, this DIY fall wreath is so quick and easy to make. 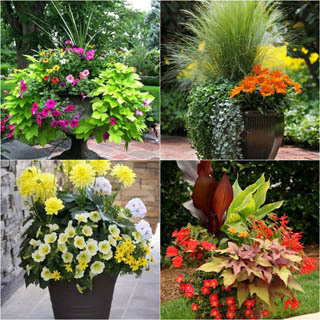 It is also very long-lasting, which is perfect for fall & Thanksgiving decorations indoors or outdoors. The idea came to me when I noticed some beautiful fall flowers calling my name outside a Dollar Store! Most of the time I love using fresh flowers and foliage for decorating, but using fresh flowers on a wreath is challenging because it is difficult to provide water for the cut flowers, which means the wreath would be short-lived. 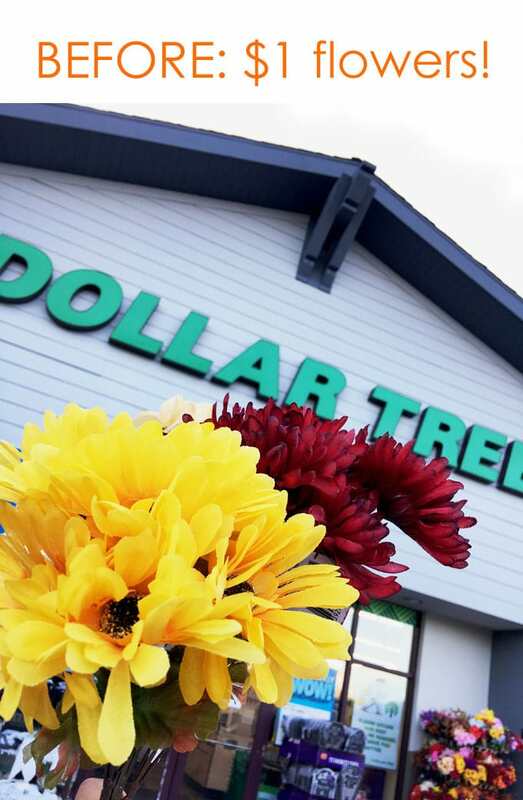 The Dollar Tree faux flowers are great alternatives to fresh flowers here, and they will last all the way through Thanksgiving. 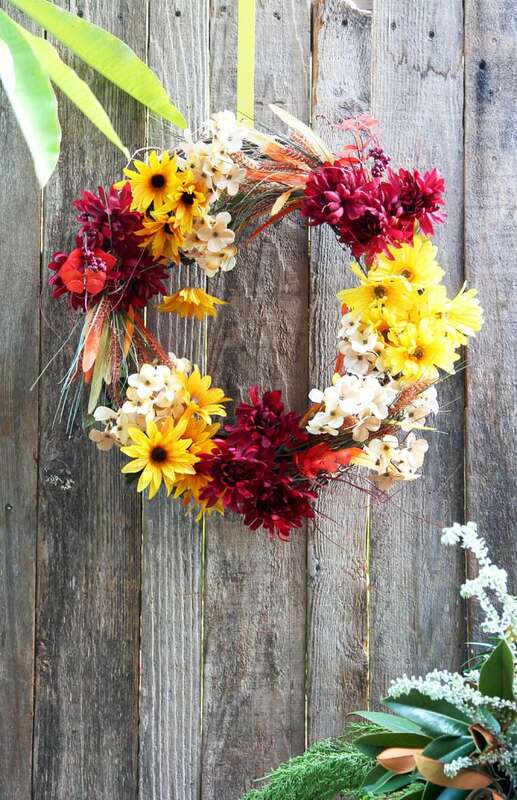 Let’s explore some creative variations on how to make this fall wreath easily in less than 15 minutes, for less than $15! 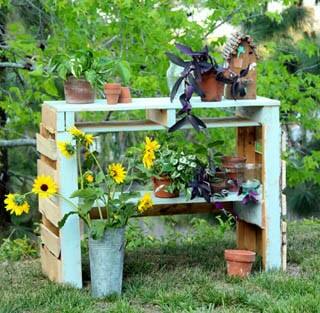 DIY outdoor fall & Thanksgiving Decorations planter tutorial. 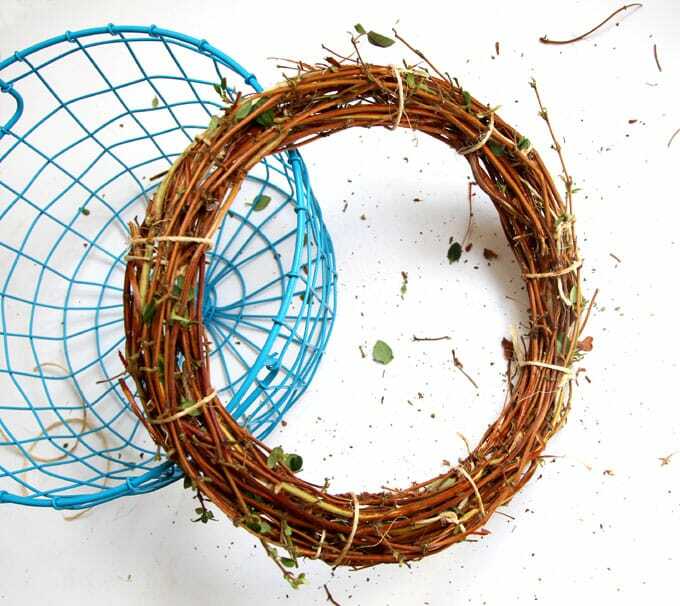 You will also need a 16″ grapevine wreath form, which can be reused again and again. Here’s a tutorial on how to make your own grapevine wreath (or any kind of vine, like Honeysuckle, etc ). 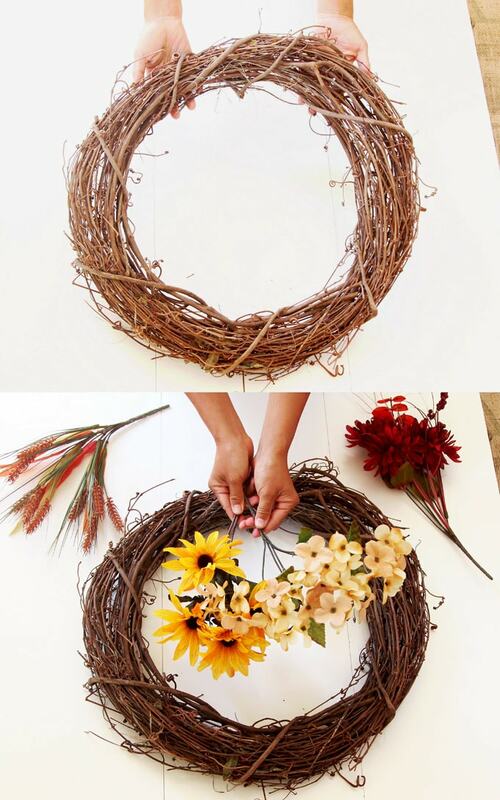 Tutorial: how to make your own grapevine wreath easily! 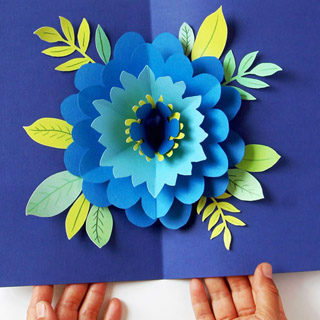 You can also buy them at a craft store or here on Amazon. 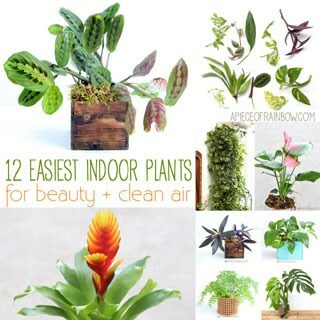 And you can reuse them to make seasonal wreaths year round! 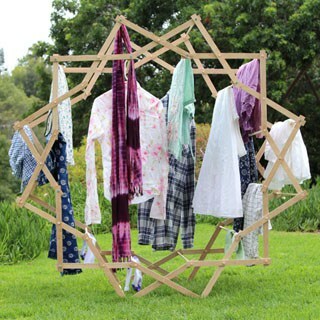 Arrange the first 3 bouquets in an equilateral triangle pattern on the circular wreath. 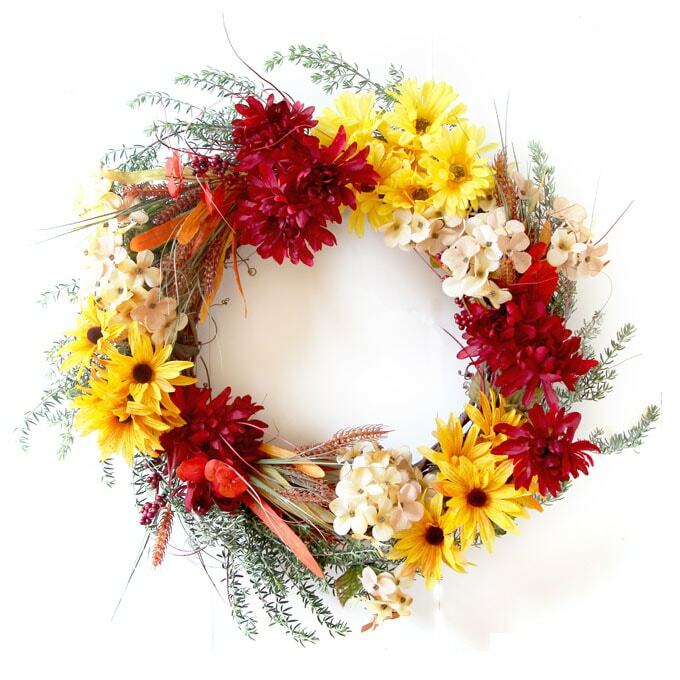 This sets up the basic underlying structure of the wreath, and it will give the finished DIY fall wreath a natural and balanced look. 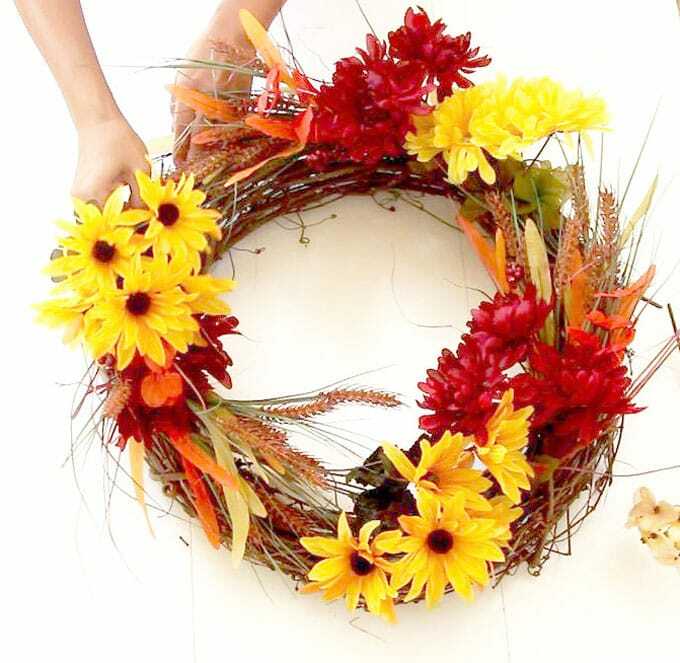 Secure each bouquet by tucking the stem into the grapevine wreath. Now we have the 3 bunches of fall grasses, let’s add flowers. Start with 3 burgundy mum bouquets, followed by 3 yellow daisy bouquets. 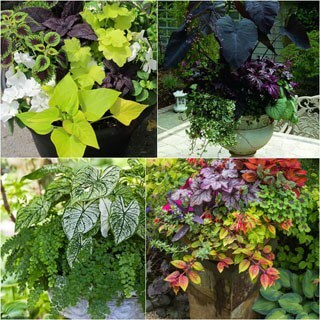 Add 3 faux Hydrangea bunches. Now our wreath is really overflowing with the beauty of fall! 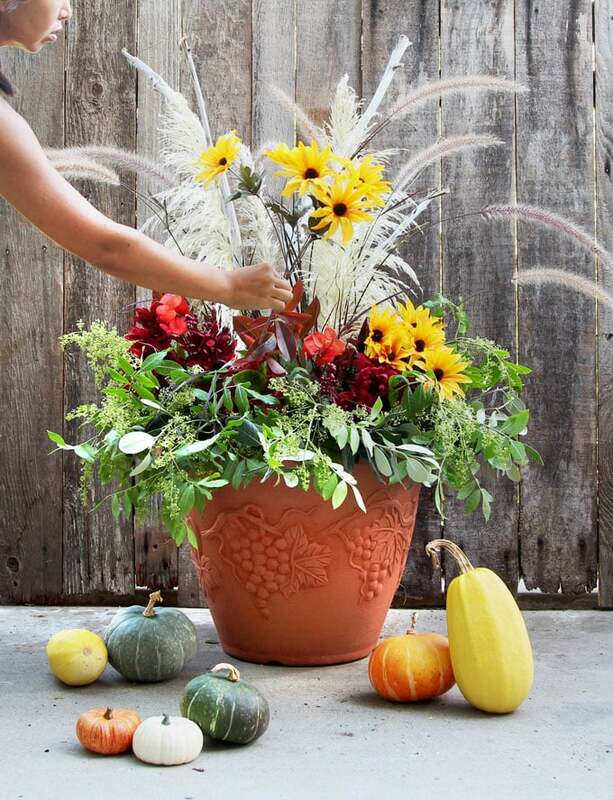 Like in the outdoor fall & Thanksgiving Decorations planter DIY , it is fun to mix faux and natural elements together. 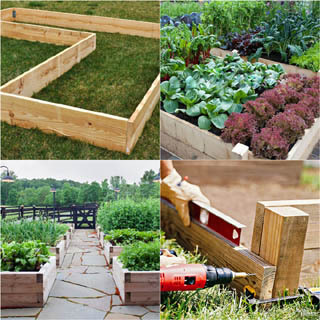 Some evergreen foliage can last many days without water. 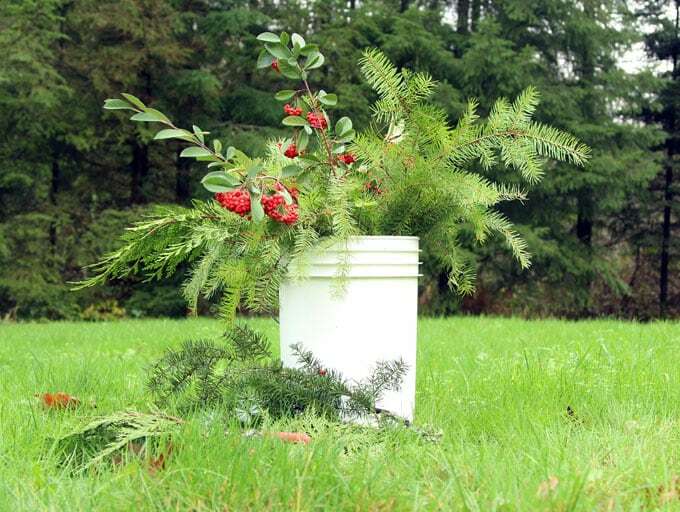 Feel free to add sprigs of natural elements like branches or berries to your DIY fall wreath, and you can change them up after a week or two to make it more interesting. 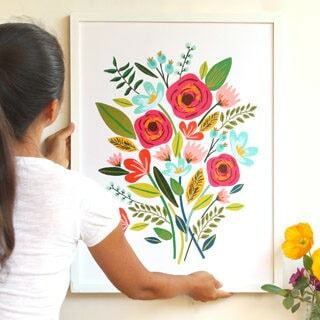 Love diy wreaths? 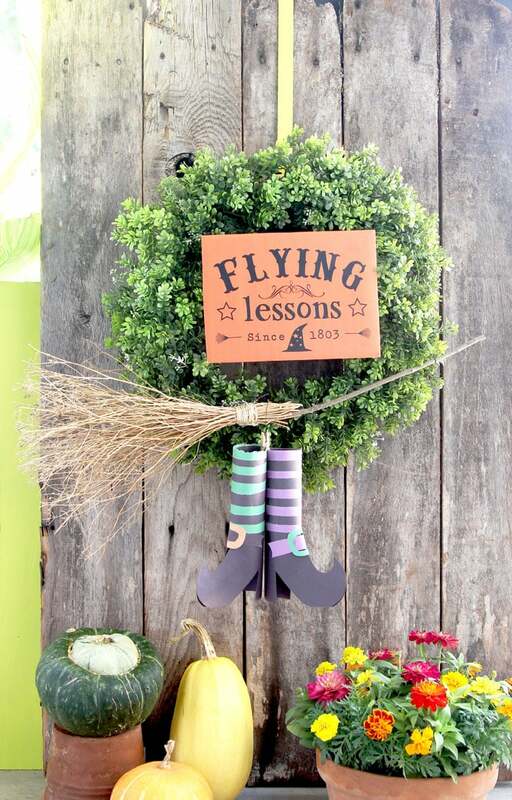 How about a Flying witch Halloween wreath? 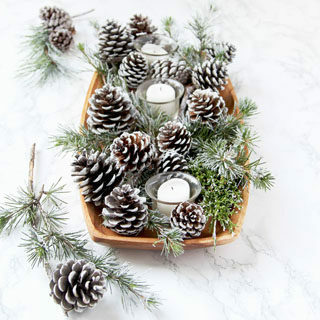 Or a fresh Christmas wreath that takes only 20 minutes to make and smells so good? 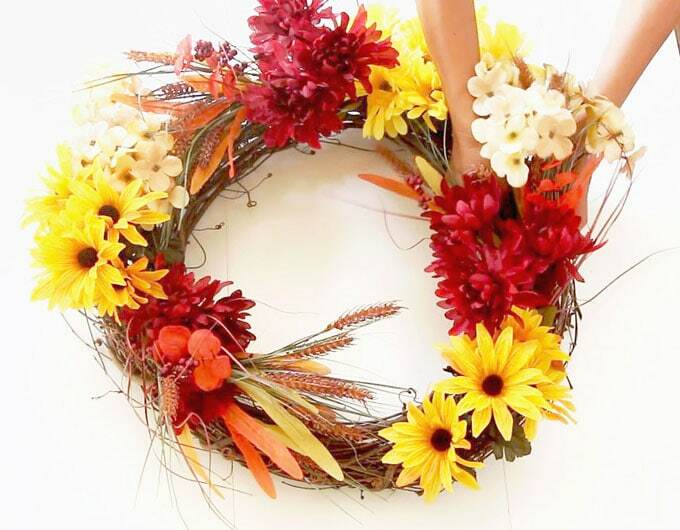 Such a beautiful DIY fall wreath! 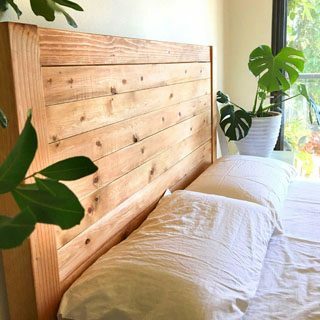 I am making it this weekend! 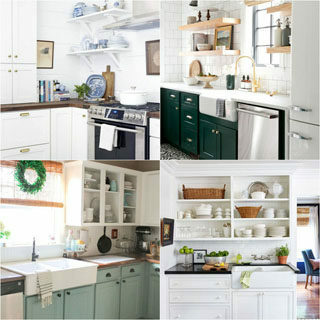 OMG this looks sooo adorable! 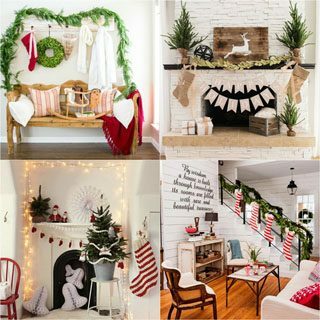 I love the idea, the wreath is absolutely adorable and I’ll try this at home.